So yeah, with that exciting background taken care of, the real tale can begin. Earlier in the week the card just flat went out and died on me during my commute. To have it fixed or exchanged, I took it the ticketing office of the Metro Subway, explain my problem and asked them to issue me a new one. At first the lady clerk didn't seem particularly surprised as I assume this type of problem is bound to happen from time to time. She asked me some standard questions, put the card in her machine and started pressing some buttons while I stood around waiting for it to be fixed. After a few minutes of button pressing and her expression started to get more confused and throwing a few "I'm sorry, please wait a little longer" at me, she called her manager who also started to look at her screen and pressed a bunch of buttons. During this they had a conversation in hushed voices and I overheard the manager saying "no, that amount of money can't be possible!?" and saw him note down at least ten figures on a piece of paper while looking at the screen. Another clerk joined in the button pressing, screen staring and the hushed conversation and after a few more "please wait a little longer" the manager came out of the office to tell me that they had to "check something with their head office, could you please wait for 5 more minutes?". Being in now immediate hurry I said "ok" and stood around waiting a bit longer while the manager disappeared into another room behind the office to make some phone calls. After another five minutes or so he comes back out with a nervous smile saying "we're really sorry but there seem to be some problem with this and it might take a day or two to fix" then, with some nervous ticks and drops of sweat trickling down his forehead "you wouldn't remember the amount of money you had on the card, would you?". I answered without thinking: "Well, probably around 3,000 yen or so I'm pretty sure", which seemed to bring him immense relief as he scurried back into the office. Two seconds later I realized that I had gotten a once in a lifetime opportunity and blew it... What I should have done was to answer, with a stone face: "I should have at least a few billion yen on it, why!? 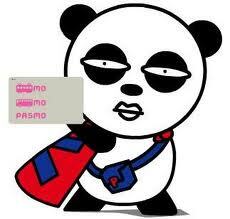 It's nothing odd about it, I'm just really really filthy rich and like to keep all my money on my Pasmo card! Now just fix it, I'm in a hurry!!!". A chance like this just comes once and I failed to grasp it... Well, I guess it'll be public schools for Baby Sunshine! at least you can cite the exact moment when you totally blew your child's entire future. The moment Daddy and every great thing he has ever done was returned to him in a moment that he totally blew. I have looked at the panda's eyes 3 times and it makes me more uncomfortable everytime. ARGH! You really blew it! I would have said at least 3万! Your honestly and clean soul is worth all the yen in karma heaven. That pesky instinctive honesty, it gets in the way at times. HAHAHA,....could have gone out of there to the nearest bar..."Next train is on me people!" Fernando - Or I could have just bought a train for myself or even the whole Tokyo Metro system! Awesome story, it made my wife and I laugh quite hard. Reminds me of paying a year's worth of back health insurance payments and the shiyakusho person asked me how many monthly payments I would like to split it into. I said 1,000. This was followed by a long period of silence. If the shiyakusho person thought that a staring contest would solve this they were wrong. After some negotiation we agreed that I would just pay it then since I was holding the money in my hand. Assuming you had said something like 1000万, is it even possible to discharge these cards? Anonymous - Yeah, exactly, that was one of the thoughts that struck me, could've been quite annoying indeed! McLucky - Thank you, glad you enjoyed it and yeah, if that guy asked he should have just arranged for 1,000 separate payments (10 yen each?)! A - No, don't think so, it would be a lot of train rides and buying gum and cheap stuff at the kiosks that take the card until I die!